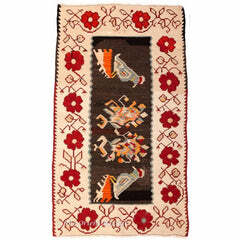 Handwoven 70+ older vintage rugs are collected and processed to fit modern houses, offices and trendy shops, with a reflection of history and ethnicity. Patchwork rugs are all backed with cotton fabric to extend the durability. Please choose your size from the menu below. After your order, we produce it within 15 days. We ship with Fedex/UPS. You will be informed of the shipment tracking number. PLEASE NOTE THAT YOU WON'T BE RECEIVING THE RUG IN THE PICTURE.SINCE THESE RUGS ARE ALL HANDMADE AND ONE OF A KIND, IT IS IMPOSSIBLE TO FIND ANOTHER RUG TILE WITH SAME PATTERN AND COLOR. WE WILL MANUFACTURE A PATCHWORK RAG RUG IN THE SIZE YOU WANT. 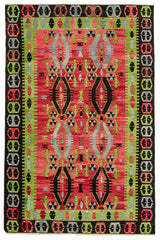 OUR TEAM WILL BE SHARING THE FINISHED RUG WITH YOU, BEFORE SENDING.